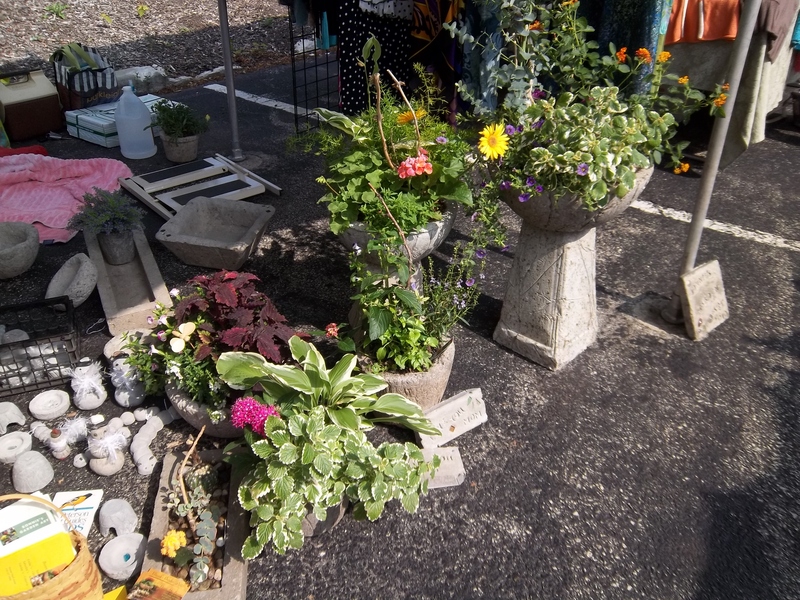 This morning we got up and went to Geneva, Illinois to visit the French Market. It’s awesome. I could almost make this a pictorial instead of an article, but I have things to say. 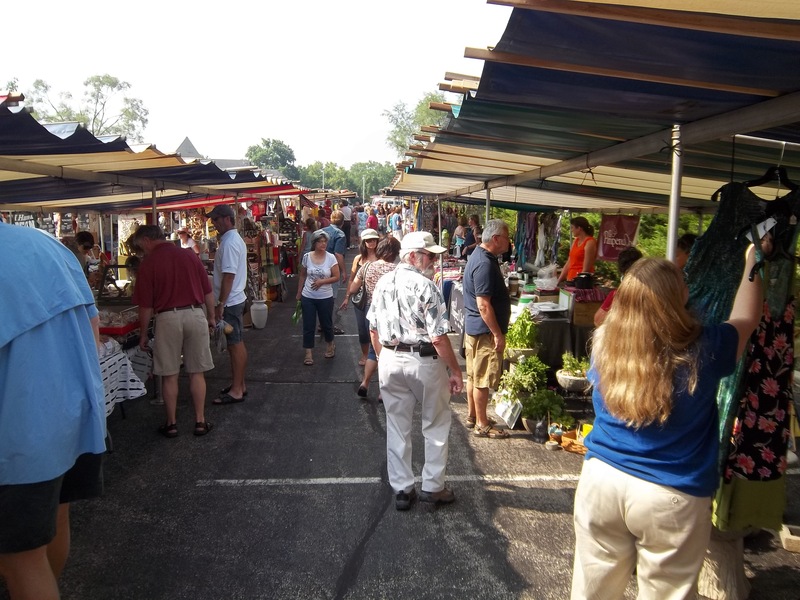 The French Market takes place every Sunday morning between April and October and it is open from 9:00 a.m. until 2:00 p.m. You can find everything from French fabrics to produce from Michigan, Illinois, and Indiana, to fresh roasted coffee. We bought tomatos, zucchini, Flaming Joe’s Tropical Fruit & Habanero Marmalade, Grandma Fern’s Jalapeno Jelly, and green beans. We got some olives that are delicious! Very buttery… which is something I don’t usually associate with olives. We came home and had BLTs for lunch, to celebrate the perfect summer taste. 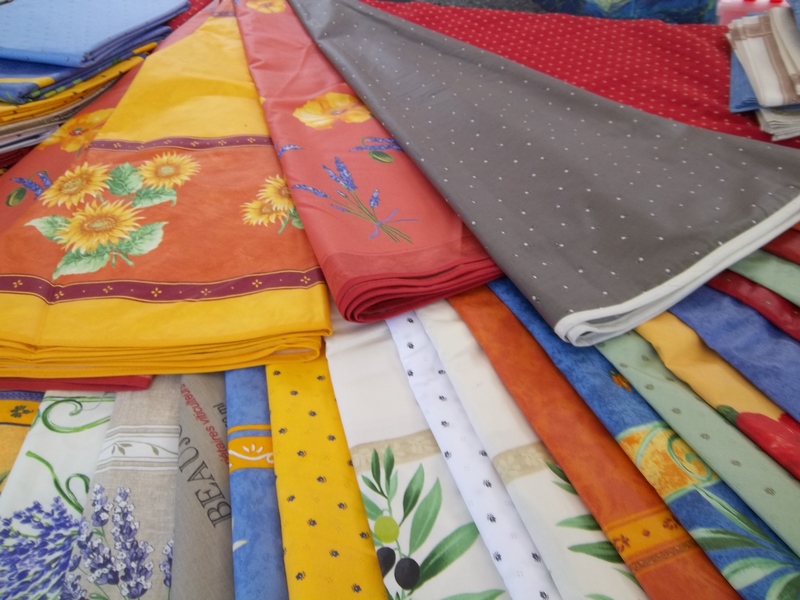 And I so love French tablecloths and napkins! The colors are bold and happy and make me smile. There is a wonderful selection. I met a few local purveyors I’ll follow up with, since they were willing to be interviewed at a later date. 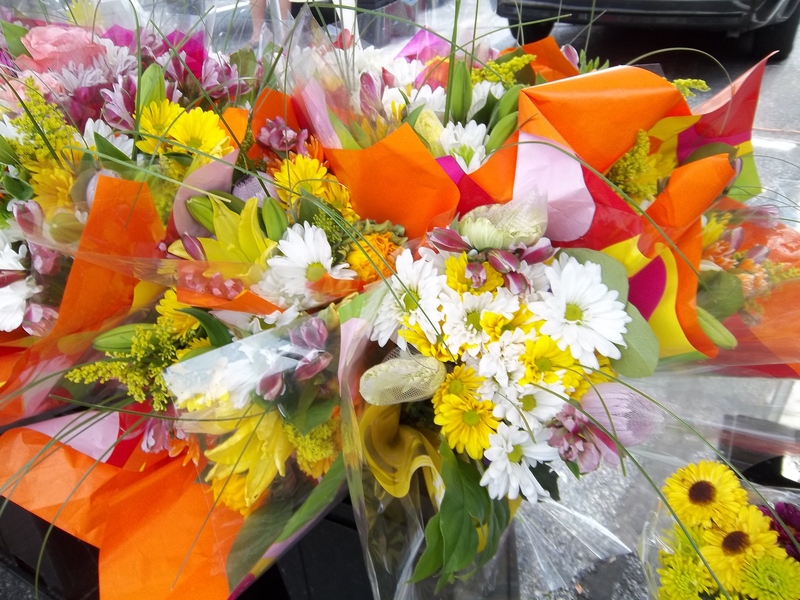 They were selling bread, cut flowers, produce, potted plants, fabric, books, home decor, aprons, jewelry, home made dips and mixes, jellies and jams, muffins, croissants, organic pork chops and bacon, olives. The list goes on and on. 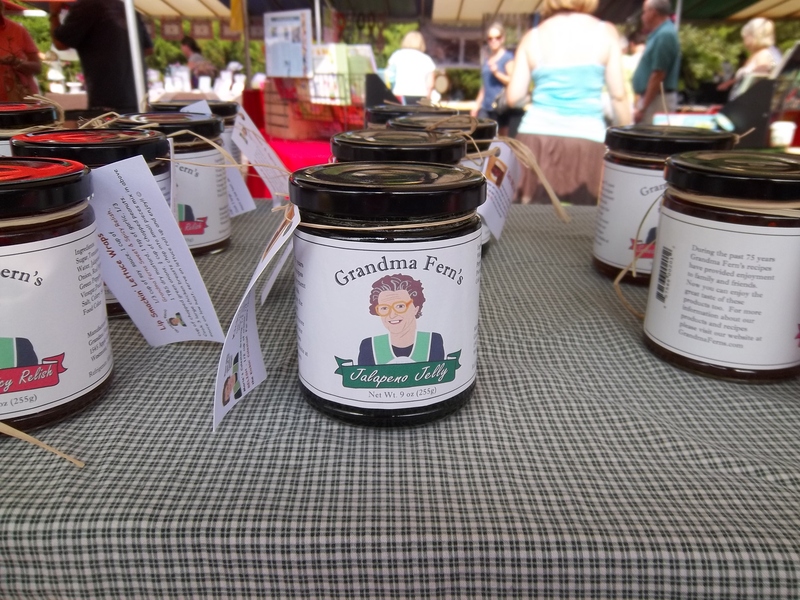 For example, I met Jennie Greenfield of Grandma Fern’s. Jennie uses her Grandma’s recipes and fresh ingredients to make pepper jelly and pepper relish. I tried both and yum! The spicy, sweet relish was mixed with cream cheese to use as a dip. I could eat that with a spoon. I can’t wait to talk with Jennie more! I had a garlic pickle for breakfast. My husband declined, but I thought it a fine way to start the day. The pickles were from Gramp’s Gourmet Foods. I believe I may have met Gramp’s grandson, but didnot have time to chat for long. I’ll be giving these folks a call. They have some intriguing pickle and beet recipes, some with hot peppers. They also sell local honey from Harvard, IL. Then there was Joe Quinn of the Second Chance Coffee Company. Joe is from Wheaton, IL and hires post-prison help to run his business and roast coffee. The coffee is carefully selected and purchased from around the world. I have not interviewed Joe yet, but suspect he is a Fair Trade kind of guy. The coffee I tried was excellent. The picture I took was not excellent; however, maybe next time. 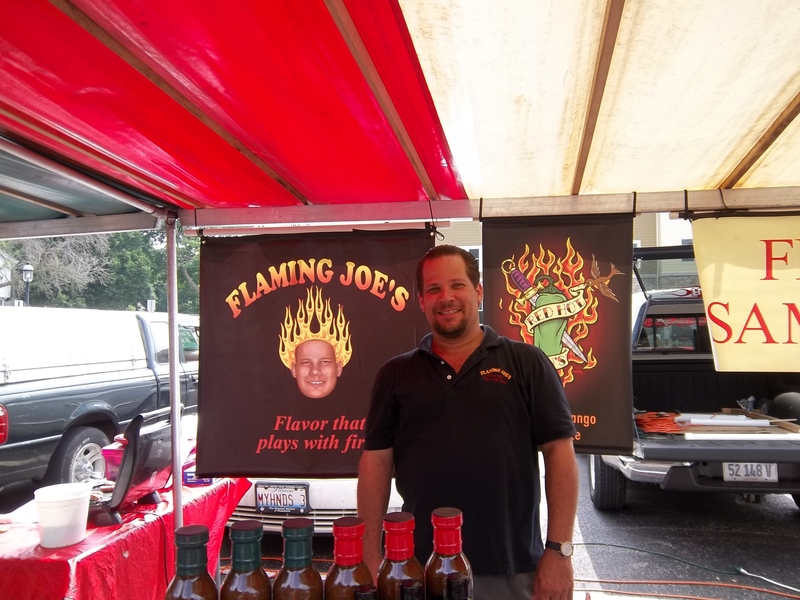 I met Flaming Joe and tried his hot sa uces and pepper marmalade. Yum again. Flaming Joe and his wife Red Hot Robin are Geneva residents who make a living with their hot sauce products. They travel to various competitions and have won several awards. I missed meeting Mrs. Red Hot Robin, as she was shopping around the Market. I hope to meet with them soon for an interview, once they return from the NOLA show. There was produce. 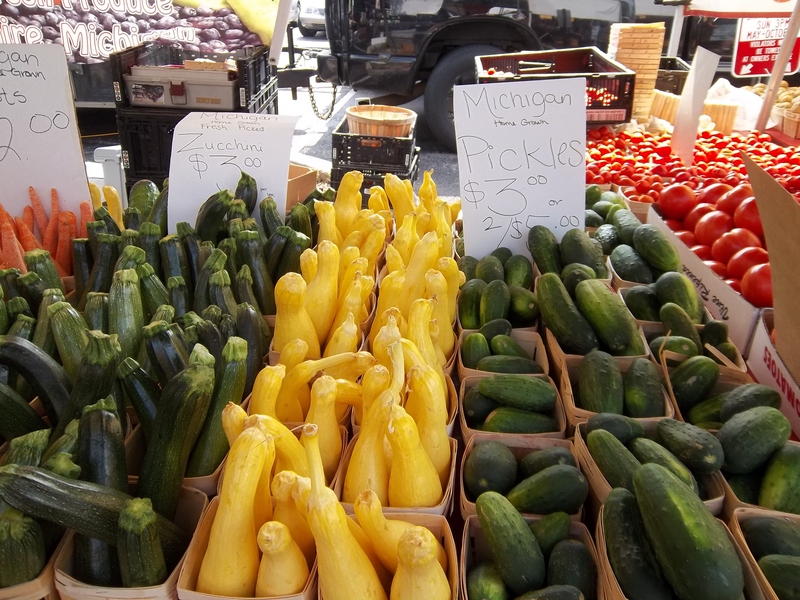 Glorious, fresh, local, colorful produce. I do love summer!!! 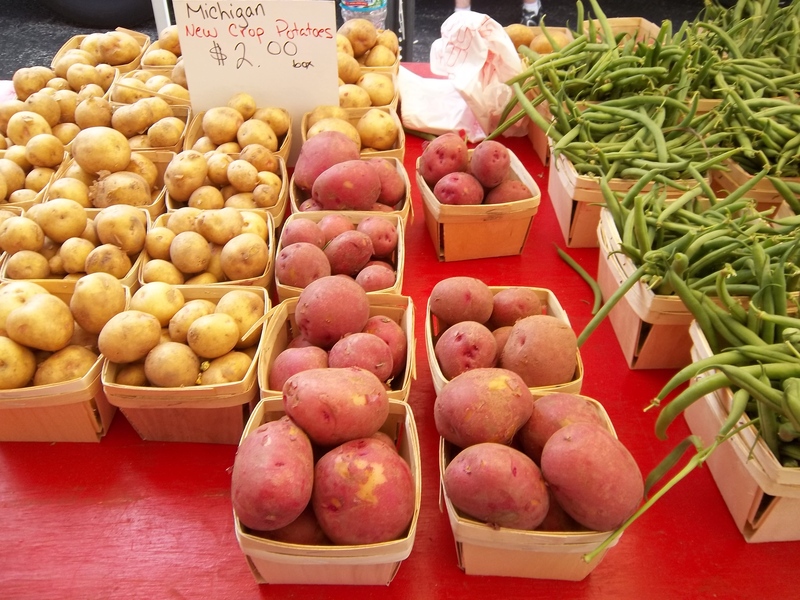 I’ll be calling on Wolf’s Farm from Eau Claire, Michigan in the future. Briefly chatted with young Mr. Wolf, but he was busy with restocking and cusotmers, so I’ll call soon. Check out these pictures. Not only do they grow beautiful produce, they know something about merchandising! Everything was displayed beautifully and the berries made my mouth water. They have a Facebook page if you want to check it out; Wolf’s Farm and Greenhouse. Tonight, we are grilling lamb chops that will be served with both pepper jellies. Green beans, slice tomatos, and mashed potatos, too. 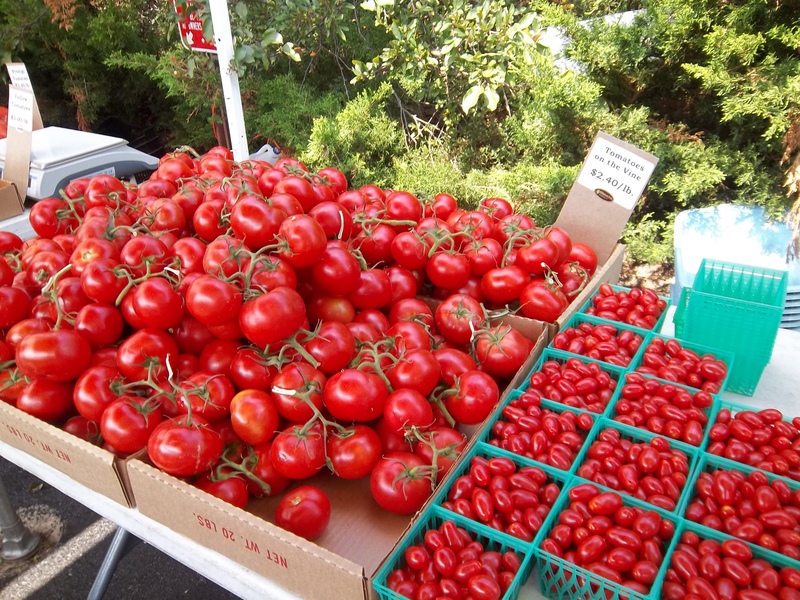 Local bounty, here we come! I took a few more photographs that I can’t keep to myself. 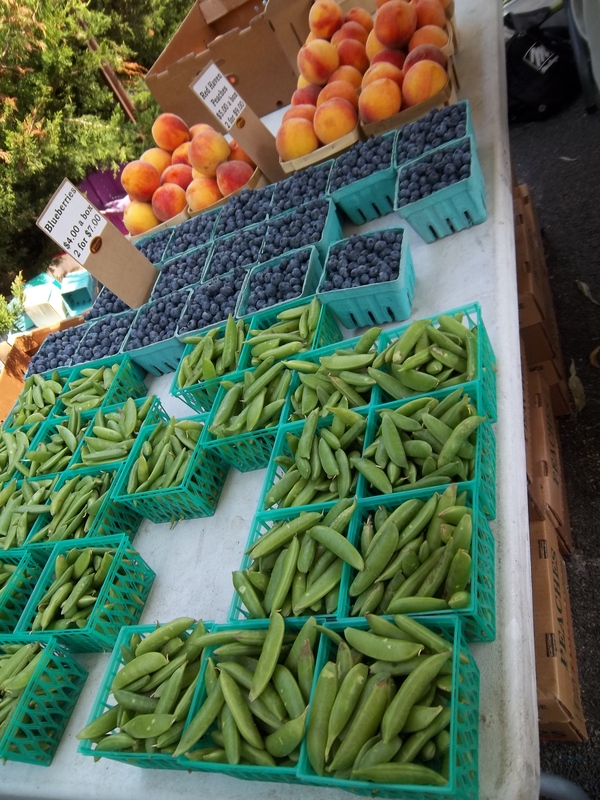 I didn’t get names and farms for all of these, but they were local folks and if they’re willing sit out in 90 degree heat, we should show support and shop our local French Market. The colors made my heart sing! If you can free up a Sunday, stop by next week. 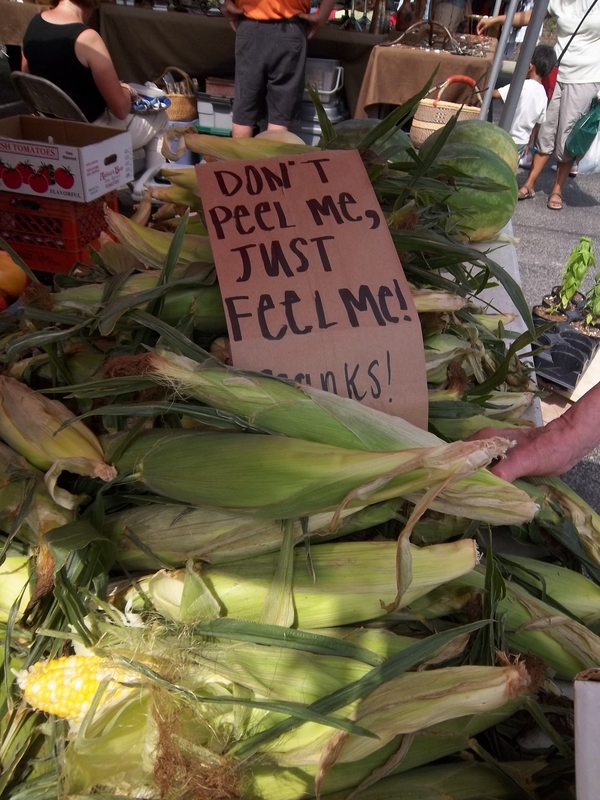 It’s a feast for the senses, and you’ll be healthier for it, too. I love all these colorful pictures! Thanks for keeping a blog. I really enjoy it.